Classic methods for pressure switch testing have been superseded with the introduction of new pressure test tools. Today most pressure switches are tested with a pressure gauge mounted to a pump to supply and measure pressure, and a DMM set to continuity to verify the opening and closing of the switch. The technician or electrician making the test is required to interpret the pressure applied to the switch when the continuity beeper sounds indicating contact closure of the switch. A workable solution but new tools can make this task easier. Modern calibrators can automatically record the pressure applied when a pressure switch changes from open to closed and from closed to open. In doing so the switch set point and reset point and deadband are much easier to determine. With a modern documenting calibrator you can test for dry contacts opening and closing on the switch or if you are using the Fluke 753 or 754 you can leave the switch connected to the live voltage and the calibrator will measure the changing AC voltage and interpret it as opening and closing of the switch. One cautionary note: it is always safer to test a de-energized circuit, but this is not always possible. Also, do not measure AC voltages above 300 V ac as that is the maximum rating of the 75X family. 480 V ac 3-phase voltages must be de-energized and disconnected from the switch if testing with the 75X family. To get started testing the switch, connect as shown above. In this example we will test dry contacts and continuity. To measure continuity for the test select resistance measurement. Then toggle to the source screen mode and select pressure to display the pressure generated by the hand pump and measured by the pressure module. Advance the calibrator mode to the split screen test mode. The next step is to describe the switch and whether it is normally open or closed at ambient pressure. The relaxed state of the switch is the reset state. The set state is the condition of the switch it changes to with applied pressure or vacuum. In this example the switch is normally open and is expected to close when the pressure applied exceeds 10 psi. Next the allowable pressure variance of the switch set state and deadband size needs to be defined. In this example the ideal switch set value is 10 psi and is allowed +/- 1 psi of deviation. The allowable reset pressure is described in the deadband tolerance. In this instance the reset state must be more than 1 psi less than the found set pressure but not greater than 3 psi less than the found set pressure. Once the test tolerances are fully defined start the test. 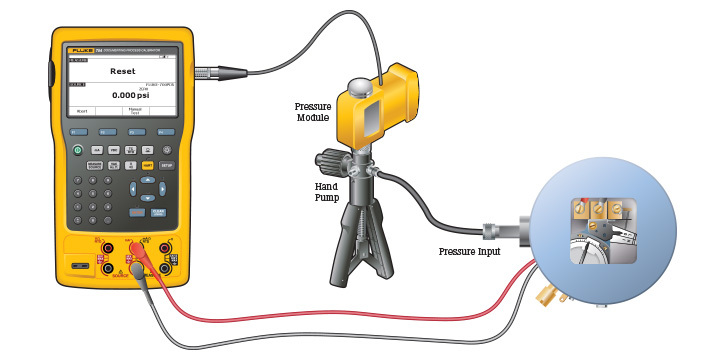 Increase the pressure until the calibrator captures the set state pressure value. Then decrease the pressure until the reset pressure is found. Repeat increasing and decreasing the pressure across the switch looking for repeatability in your set and reset pressure measurements. Once satisfied with the result press done to get the pass/fail evaluation of the switch. If the switch fails the test adjustment or replacement of the switch may be required. If the switch is adjusted repeat the test to document the As-Left condition of the switch before putting back into service. The test result is now documented and ready for upload to calibration management software.